I assume you’ve heard the names “Penn & Teller” at some point in your life. If you are interested in weight loss, you probably are aware that Penn Jillette lost around 100 pounds. He began his weight loss journey with this method – The Potato Hack. We read about it and decided it was worth a try. The information we found indicated that there is usually weight loss between half a pound and a pound daily while using the hack, and continued loss for several days afterward. The recommendation was for 3-5 days of potato hack, then resuming healthy varied meals. It’s pretty simple, really. Eat potatoes. The recommendation is up to 5 pounds of potatoes a day, cooked (sometimes cooled), plain. Personally, I feel that a dash of salt is beneficial, as I noticed signs of sodium deficiency around the third day. 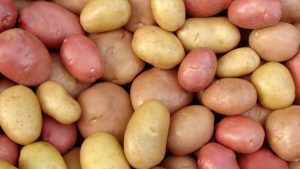 The main reason to eat only plain potatoes – without even salt, the first day – is that it sort of “resets” your taste buds and brain. Americans are so used to added flavors that the basic goodness of food has become “lacking” to them, but the simplicity of real food is amazing. Also, once you go back to eating other foods, the tastes are brighter and practically *new* because of the “reset” that just took place. Any kind! There are a lot of varieties, so be adventurous! We tried Yukon Gold on the recommendation of several sites. While their flavor is different from Russetts, they were not my favorite. They have a faint “sweet potato” taste to them. That was NOT why I didn’t care for them, but it was a factor for one of my children, who dislikes sweet potatoes with a passion. My favorite is red potatoes, small, boiled with plenty of salt, followed closely by Russetts, baked. How do you cook them? You can bake them or boil them – either one results in a cooked potato. I prefer them baked, for texture, unless I’m eating them immediately. To me, boiled potatoes get slimy once cooled. My husband didn’t agree, though, so you might try it before deciding against it. Cooling them does more than just keep them for later, too. The quantity of resistant starch changes based on cooling. I haven’t done a LOT of research on this, but some varieties increase in RS while others decrease. I did the potato hack, eating only potatoes – no salt or seasonings whatsoever – for 3 days, followed by two days with salt and a dash of oil. In the first week (7 days), I had a 13-pound loss. In the following week, I saw two more pounds go. Following that, my weight stayed steady for three full weeks, despite eating pretty much whatever I wanted (though, to be fair, “what I wanted” changed a little, due to the hack, too). It is about six weeks later now. In the last two weeks, I have gained back a little over half of that, because I stopped paying attention to what I ate. Because of this, I recommend paying attention and, if weight starts creeping back on, notice what you’re eating and re-do the potato hack to get back on track. 3-5 days every 4-6 weeks seems quite doable, for lasting weight loss, don’t you think?